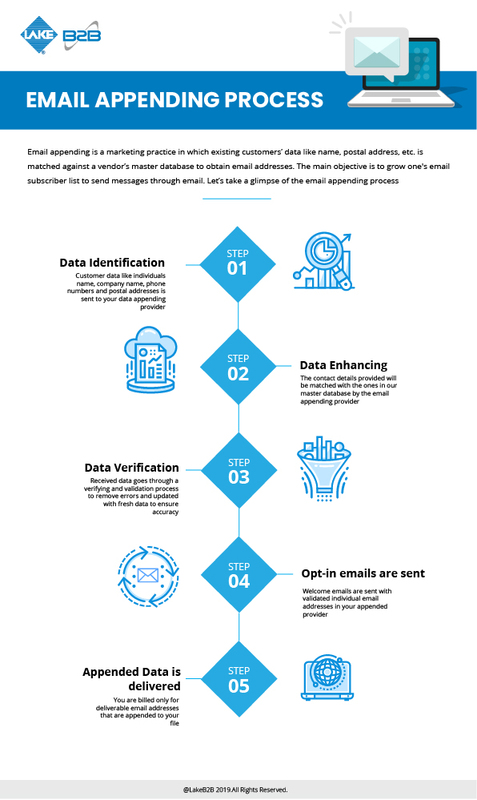 Email Appending is marketing practices that involves taking known customer data like, first name, last name, and postal address and match it against a vendor’s database to get email addresses. This practice is also known as e-appending. Most businesses prefer to keep in touch with their customers through emails as it is the most fastest, simple and affordable marketing channel. Most customers want to be informed about your products and services. And when you have emails missing from your database it reduce deliverability and communication with potential business prospects. At Lake B2B we are here to help you with our Email Appending Services as a means of communication that is inexpensive and cost effective. At Lake B2B we provide active email addresses and phone numbers of targeted customers to help you reach out to them effortlessly. This not only drives customer acquisition and retention but it also maximizes your results. Our Email Append Service will ensure accurate and up-to-date email addresses to maintain business communication, keep your data free of stale records and minimize email bounce rate. Reaching your target audience in today’s highly competitive market is not an easy task. You need to have access to accurate data so that you do not waste time going behind non responsive leads. With Email Appended Database you can roll out marketing campaigns to customers in the US, UK, Canada, Europe, Australia and many more countries. You can also strengthen your business relationship and expand customer network. We at Lake B2B believe that an Appended database can enhance the size of your email list turning into a revenue-generating machine. It can boost your ROI through email marketing, tele marketing and direct marketing campaigns. If you are still using your old customers’ database it’s about time you avail our Email Address Appending Service and reap benefits.